What about the recession? Isn’t this a bad time to start a new business? No way! People must eat. And the trend in food service is towards pick up and take away foods as the recent Time Magazine article highlighted. It’s a growing industry even when the economy is faltering. The key to success is drawing upon our more than 20 years of first hand experience. Will Hodgskiss, the owner of Willydogs, was himself a hot dog cart owner. He built his business from the ground up and learned a lot about the business along the way. Now he is sharing his knowledge with you. 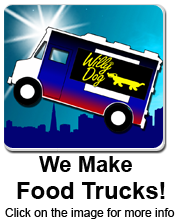 Our free online business guide helps you find recession proof locations in your area where you can set up your new Willydog cart. And we teach you how to run your cart and avoid the pitfalls that those without our experience often run into. See our Section on Daily Operations or learn about a Typical Day in the Life of a Hot Dog Vendor. I received my new Hummer in June of 2009. She is a beauty. The first thing I had to do was inspected by the health inspector in Windor, CT. The man came out to my cart (initially on the phone he told me it would be a lengthy process including igniting burners!) walked around it, ran his hands over it a few times and said he was ready to go back inside. Odd I thought but hey, that’s easy enough. Well we got inside and as he was filling out the paperwork he looked at me and said “You know, that is the nicest cart I have seen in a LONG time.” Then he asked me a million questions where it came from. He was quite impressed. I have people comment daily on how nice my cart is. I take good care of it and it gets covered nightly. It took a while for me to get the hang of steaming my dogs, my first couple of weeks I split lots of dogs and totally overestimated how many people would stop by. The neighborhood dogs loved me for a few weeks. The good news is I now have a very loyal following (sadly, winter is here and I will have to shut down as I work in an open field) and I have perfected my “steaming” of the dogs. Yeah me! I absolutely love my job and that is the first time in 35 years I have been able to say that! I can’t wait till spring gets here…. Here’s hoping for a short winter… ha, This is New England! Thanks guys for a job well done…. I will send pictures of the crowds come spring! 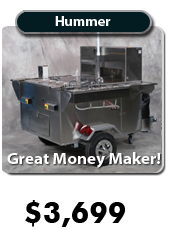 Check out our Hot Dog Cart tutorial on How to Select a Profitable Vending Location. 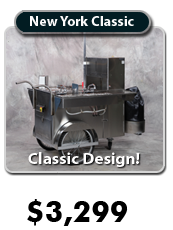 Worlds Best Hot Dog Carts manufactures all descriptions of high quality vendor carts and concession stands for the food vending industry. 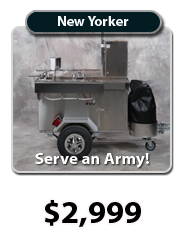 We are one of the largest producers of mobile restaurant equipment in North America. Even more important to you, though, is our experience, quality and customer service. These key aspects put us head and shoulders above our competitors. Our customer service and support, for instance, are unmatched. This is because our company’s roots are right in the food stand business. The owner of Worlds Best Hot Dog Steet Carts, Will Hodgskiss, himself started out in this business as a hot dog stand operator over 20 years ago. Therefore we have valuable first hand knowledge in how to operate a food cart on a day to day basis. That kind of genuine “hands on” experience is invaluable to you, the buyer. How so? First, we will help you pick the right cart to match your circumstances, goals and budget. 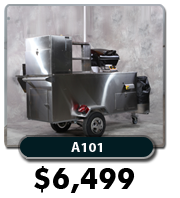 If you have never operated a food vending cart before, choosing one can be a daunting task. Will it be big enough for your marketplace? Will have the features you need? Will you be able to add new equipment later? There is no need to fret or worry. Draw upon our experience. We will help you select the right cart for you, the first time. We even teach you How To Get Started in a Hot Dog Cart Business. I just got off the phone with you. I wanted you to have my e-mail address, so I decided to send you this brief note. Again, THANK YOU for getting me into this business. Things are going great. I’m doing about $600 – $700 a day during the week, and around $1000 a day on the weekends. Good stuff. As you remember, I had kind of gone under in the real estate finance business. You saved me, Will. Thanks again. Use me as a reference if you would like to. The cart is GREAT. I modified the Hummer a bit, and mounted two 40-pound tanks on the front of it. I had the work done by a welder here in Syracuse. I’ll e-mail you some digital pictures. It really is a great cart. Again Will, Thanks for a great product, and thanks for everything you did for me. If someone told me ten-years ago I would be selling hot dogs and sausages for a living, I would have told them they were nuts, but I couldn’t be happier doing this for a living. AND… I’m making great money. But more importantly, it’s a LOT of fun too. I have a radio playing at the cart all day, Jimmy Buffett and Bob Marley….today I was actually dancing with a customer who pulled up to get a few sausage sandwiches! Must have been quite a sight! First we help you get set up in business. We will even help you understand and meet all those intimidating and confusing health code regulations! We have already done a lot of the time consuming home work for you. 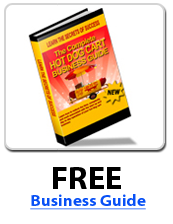 Our Hot Dog Cart Business Planning Guide and Hot Dog Cart Operations Manual are without a doubt the best available. Check out the loads of carefully prepared information in the Business Planning section of this site. These guidelines are written in a simple easy to understand format and are designed to help you make a success of your new food vending business. From the moment you start thinking about starting your business to the first day of operating your new mobile food stand, we will assist you in every way possible. Just read the letters of appreciation from our happy successful customers in the Business Planning section. It’s no wonder that Will Hodgskiss has won so many business awards! It’s no wonder he has so many repeat customers! 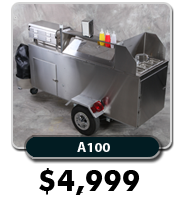 Our hot dog carts are built to last with quality stainless steel and use continuous welds wherever possible for maximum strength and durability. 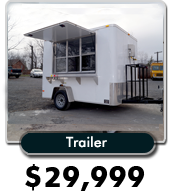 They come with features and options that reflect our personal first hand experience in the mobile food vending business. These carts are also designed to be adaptable and flexible. That’s often the key to success in any business. Check out the variety of optional equipment and add-ons that we offer. We can even build you a custom made cart to suit your special needs. Whether you are planning to serve breakfast, lunch or dinner; fried eggs, hotdogs, or steaks, we can help you to make it happen. 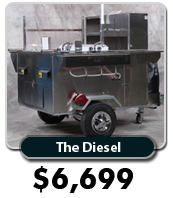 The product line we offer ranges from small table top models and economy starter hot dog carts right through to fully enclosed trailer mounted 2 person concession stands. Our compact road worthy hotdog carts are marvels in engineering. Though small in size they are loaded with features. Some of these units have been described as little restaurants on wheelsâ€?. 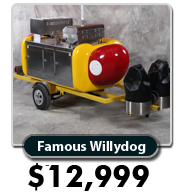 Our pride and joy are the colorful and eye catching “WillyDog” carts. 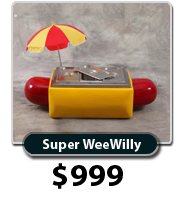 This series of hot dog carts made from food grade fiberglass and stainless steel include the Table Top Willy, the Mini Willy and the full size flagship Willy Dog cart. These bright red and yellow carts formed in the shape of giant hotdogs are without peers in the industry. Although it’s their unique and appealing look that draws customers, it’s their many handy and useful features that attract vendors. Custom carts. We can make a special cart just for you. We are able to ship your food cart anywhere in the world. Alaska, Arizona, Maryland, Vermont, Texas, California, Florida, Oklahoma, California, New York, Illinois, Pennsylvania, Ohio, Michigan, Georgia, New Jersey, North Carolina, Virginia, Massachusetts, Indiana, Washington, Tennessee, Missouri, Wisconsin, Minnesota, Colorado, Alabama, Louisiana, South, Carolina, Kentucky, Oregon, Connecticut, Iowa, Mississippi, Arkansas, Utah, Nevada, New Mexico, West Virginia, Nebraska, Delaware. This site is a huge index of all the county health departments in every state in the USA. It’s a big site! Go the the A-Z index. Then to the “S” in the Index. It provides a list of links to all the various State health departments. Another big site. Lots of info. Click on the button for “Federal and State Gov’t Agencies”. Then go down to the heading entitled “State and Local Gov’t Agencies”. If your state isn’t listed click on the first subheading “Overall Listing of State, County and territory Listings”. There you will find a comprehensive contact list. Information for foodservice professionals in 14 languages! Excellent information on safe food handling, meat storage guidelines, and background info on the meat products you will be selling. Just type “hot dog” in the search box in the upper left corner of the home page. Another large site with tons of information. Go to the “Special Interest” area in the lower right corner. Check out “Starting a Food Business”. For detailed info on laws and codes check out “Fed/State Food Programs” go to “Retail Food Protection” click on “Regulations, Codes and Code Interpretation”. Click on “Food Safety”. Many other useful links. This Illinois Health Department site has some excellent info on food safety and printable charts on food temperature requirements. Canadian Federal Government Health site (Health Canada). In English or French. Go to the A-Z index to “F”. Click on “Food Safety”, then click on “Safe Food Handling”. Canadian Food Inspection Agency (CFIA) site. In English or French. To find your local food health authority anywhere in Canada follow these instructions: Click on “Food”, then “Retail Food”, then “Information for Restauranteurs and Food Service Operators”, then “Local Inspection Authority”. Also go to A-Z Index, Then click on “Food”, then go to “F” for “Food Safety Tips”. Good info at “Barbecuing”. This site has some really good plain language tips for a cart operator. Click on “Living”. Click on “Public Health” on the drop down menu. Then click on the “A-Z Index”. Scroll down to the heading “Requirements”. Good info! Click on “Health” under the heading Living in Toronto. Click on the A-Z Index. Scroll down to the heading Requirements. Excellent information in a practical easy to read format! Check under Health Information Sheets for Carts. A nice summary of basic rules for hot dog stand operators in Ontario, Canada. 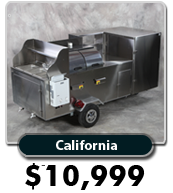 Weiners: The following list is a selection in alphabetical order of various American vending cart meat suppliers in the U.S. Just click on the links provided and find a distributor or warehouse nearest you. Foil Hot Dog Bags: These are a specialty item that can be sourced through a restaurant supply company or from a specialty paper manufacturer. Here is a list of potential suppliers.